Reading is one of the many fun activities children do during the summer, and research shows that it’s so important. Children who read during the summer increase their reading level, build vocabulary, and expand their comprehension skills. Because we believe reading is an essential skill for our students, MPA is giving each child in Lower School the gift of a summer reading book and a journal! All upcoming kindergarten and first grade students will be required to read “In My Heart; A Book of Feelings” by Jo Witek over the summer with a parent or guardian. There is also an assigned project for the children to complete after they read the book. This assignment should be done prior to the start of the 2018-19 school year and can be brought back to their new teacher at Back to School Night or the first day of school. 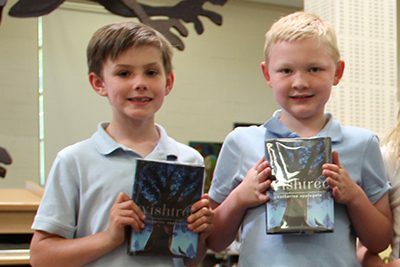 All upcoming second, third, and fourth grade students will be required to read “Wish Tree” by Katherine Applegate over the summer by themselves or with a parent or guardian. There is an assigned project for the children to complete after they read the book that must be completed prior to the start of the 2018-19 school year and can be brought back to their new teacher at Back to School Night or the first day of school. Research shows that reflecting and journaling about books is a terrific way to build reading and writing skills and helps students make connections to the world, too! Students kindergarten through ninth grade received a summer reading journal to make this possible. This journal was created by Sara Mohn, Upper School English teacher, and avid reader and writer. We encourage families to record books read over the summer, write journal entries together as a family, or have students draw pictures to reflect upon the books read. Completed journals should also be returned to school in the fall. MPA recommends that students read at least six books over the summer to maintain their reading fluency or 10 books to increase reading fluency, build vocabulary, and boost comprehension. A great way to find additional summer reading books for your children is to check out the booklists on the MPA Library Website. And a very special thanks to Ms. Lage, Ms. Petrich, and the library volunteers for their work on getting the summer reading bags ready for students and supporting literacy within our families in such a beautiful way! If you have questions about the summer reading assignment or how to find age appropriate summer reading titles for your child, please email Mrs. Wright or Ms. Lage. Have a wonderful summer and enjoy reading together!